When the D23 Expo 2017 opens tomorrow, Disney fans will be introduced to an all-new and entirely cute kind of car called the Minnie Van. This one-of-a-kind 2018 Odyssey minivan will be unveiled by Honda and Disney at the Anaheim, California convention for Disney fans. 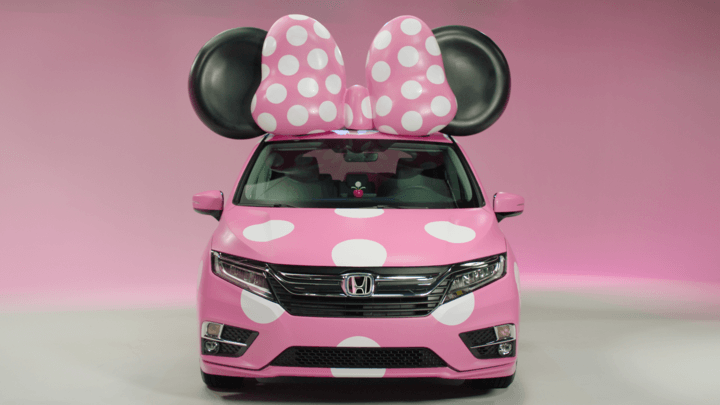 Inspired by the iconic character Minnie Mouse, Honda has created the Minnie Van for display at the 2017 D23 Expo. The Minnie Van will be a part of the “Minnie’s Style: The Fashion House of Minnie Mouse” display presented by the all-new Odyssey, showcasing a selection of Minnie’s iconic dresses and accessories from throughout the years. Attendees may register at the Honda display to have their photo taken with the MINNIE VAN, and receive a special keepsake. The van will be for display only and will not be for sale. It’s created in celebration of Honda’s partnership with Disney-ABC and the “Disney Unlock the Magic Sweepstakes.” The sweepstakes and exclusive Mickey and the Roadster Racers custom content piece will air on Disney Channel and Disney Junior with special appearances by Disney characters and the 2018 Honda Odyssey minivan. The “Disney Unlock the Magic Sweepstakes” will choose one lucky winner to receive a grand prize vacation to the Disneyland Resort, plus an all-new 2018 Honda Odyssey. I also conceive this is a very good website.